digggiya: Cool sounding effects in that riff! Monte: The lesson sample sounds great, what pre-amp you using teach? Lyle: I use a Rocktron Voodu Valve direct into my pc. Lyle: Try playing these power chords along with the jam track. Lyle: For these rhythm examples, try using a straight ahead tone, no fx. This will help make your rhythm sound tighter. larry: What's a straight ahead tone? A clean tone? Lyle: Clean or distortion, just don't add fx. Lyle: In this next example you'll still be playing power chords, but the 1st and 2nd strings will remain open and "drone". Lyle: The Edge uses digital delays on many of his guitar parts. A delay effect can give a simple riff a bigger sound, almost like two guitars at once. It's important to set the delay timing to the right speed and match the tempo of the song. I've had many people asking me how to set their delay times to match the tempo of the song. 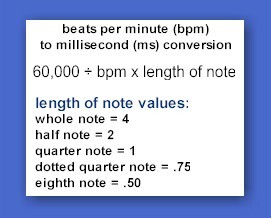 First, you need to know the tempo or beats per minute of the song. You can use a metronome and set it to click real close to the beat of the song. panik: How does The Edge do it in live? I'm impressed. Lyle: He has pre-sets in his rack of digital fx and then controlled on and off via footswitches. panik: Could you give us an example of how to use the conversion chart? Teacher: Can anyone tell me what the delay setting in milliseconds would be if I wanted a quarter note delay? Lyle: panik, larry and Tula got it! 422.5 mls is the exact setting. skud: Are footpedals all right for a cheap beginner who doesn't have one yet? Lyle: This next example uses the delay setting to fatten up the sound. You'll be playing just the 1st and 2nd strings in this riff. The 2nd string follows each chord by playing a 5th above the chord. Lyle: Don't worry if you don't understand what that means, just learn the riff! If the 1st chord is E, count up the E maj scale and find the "5th degree". = B.
Lyle: Listen and watch the video clip and you'll notice the rhythm being used. skud: I like that little rhythm - dat, dat, that matches the drums! Lyle: Yes skud, try to match that drum accent with all of these examples in the lesson. You'll see and hear me doing that in the video clips. Lyle: Mess around with all of these examples. Try them with clean tone or an acoustic! An acoustic 12 string would be awesome on any of these riffs! larry: Does it help or hinder to use a compressor? Lyle: I sometimes like them with clean settings, but I don't think you need them with distortion. panik: Besides tinkering around, what is a good way to learn about how to tweak effects and tone, do you know of any resources? Lyle: My suggestion is to limit yourself so you don't use too many fx at first, listen and read about what your favorite guitar players use and then try to emulate their sound with the tools you have. Standard stuff to have is a wha wha, distortion, chorus, delay, and reverb.